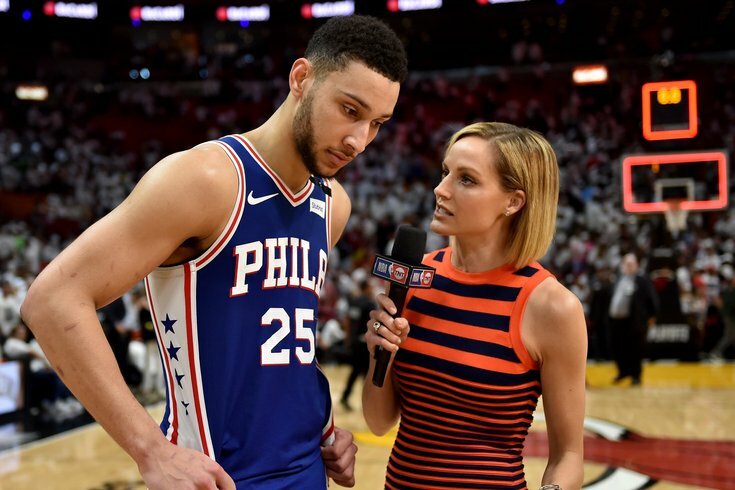 Philadelphia 76ers guard Ben Simmons is being interviewed by a reporter after the 76ers defeated the Miami Heat in game four of the first round of the 2018 NBA Playoffs at American Airlines Arena. For the first time since 2012, the Sixers have a chance to close out a playoff series on their home floor. And unlike when they toppled a depleted Chicago Bulls team way back when, these Sixers are out front on merit. They have the superior talent to the Miami Heat, and through the first four games of the series they have outexecuted and out-schemed them when it matters. Those things ultimately mean nothing when it comes to actually getting a win in Game 5. Each game in this series has been its own entity, with wrinkles thrown in on the fly. Game 1 was highlighted by a shooting barage from the Sixers, Game 2 featured the Heat stifling the Sixers with ball pressure and physicality, and so on and so forth. It's tough to incorporate new concepts when the teams become this familiar with one another, which everyone from the coaches to the players is aware of. "Their last memory here was winning, and they did it with a certain style, and they tried to continue to do it in Game 3 and 4, we get it," said Brett Brown at Monday's practice. "You don't have to be a wise man to know what is about to happen, what style of play they're going to try to play, especially when they're going to go home if they're not able to find a win." So there's really only one question left for the Sixers to answer as the series returns back to Philadelphia: what do they have to do in order to emerge from Game 5 with a 4-1 series victory? It is no secret that Miami's highly-paid center has had a tough series, which most casual fans would deduce from looking at a box score. But his lack of scoring is nowhere close to the biggest issue for the Heat, and the Sixers should try to involve him on the defensive end as much as humanly possible. Whiteside is plenty capable of blocking shots at the rim, but if you force him to defend his space he is absolutely cooked. His off-ball awareness has been close to zero in this series, and the Sixers did an especially good job of picking him apart on cuts in Game 4, despite their turnover issues. This is part of the reason the Ersan Ilyasova at center lineups have been so critical to Philadelphia's success against Miami. Regardless of who the Heat decide to stick Whiteside on in these scenarios — the answer has been Dario Saric on many occasions — he is having to pay attention to the perimeter and off-ball movement. It is decidedly outside his comfort zone, and with Joel Embiid back and starting at center, it means every minute Whiteside spends on the court will have to be spent paying attention to action away from the rim. When he can't play with everything in front of him, Whiteside's uselessness is put under the microscope quickly. He's not even the sort of player who tries hard and just ends up out of position, he's clueless and is often left unaware of a cutter until said opponent is already scoring at the rim. The problem for Miami is that some of their counters have been diminished as the series has worn on and the Sixers got healthier. Kelly Olynyk was a nice curveball for Erik Spoelstra in Game 1 and 2, but with Embiid back in the lineup, it's harder for the Heat to find a heavy-usage role for Olynyk. Bam Adebayo is a superior defensive option, but the Sixers don't need to prepare for much more on the defensive end other than stopping lobs to the rookie. And this is with an engaged Whiteside. He frequently crumbles mentally or checks out of plays, particularly when things aren't going right on the offensive end. The Sixers have come right down his lane immediately after Heat turnovers, and Whiteside has been a passenger as teammates have to take fouls to prevent sure points. If it were up to Brown, he would probably prefer for his counterpart Spoelstra to play Whiteside as much as possible. He has done nothing in this series to warrant any sort of respect on Philadelphia's end, and they can exploit his presence in a multitude of ways. We're not exactly splitting the atom or reinventing the wheel here, but sometimes your first adjustment can be the most important one. Brown has shown a willingness to continue calling on Ilyasova to man the five spot, and the veteran has rewarded his coach with production. A big reason this lineup is working? It diminishes the impact of building lineups around a non-shooter like Ben Simmons. Philadelphia's turnover problem in Game 4 was caused in part by congestion in the paint, which is only natural when you're relying on an initiator who repeatedly drives and kicks with rarely a thought about pulling up for a jumper. By doing nothing other than standing in the corner and forcing teams to respect his jumper, Ilyasova would help the offense. But because his first read on many plays is to be that perimeter outlet, Miami has opted to put smaller, quicker defenders on him in order to crowd and contest. There's just one problem with that — when Ilyasova has those cross-matches and ends up with an offensive rebounding opportunity, Miami is powerless to stop him on the glass. There are downsides to going all in on Ilyasova at the five, certainly. Dario Saric is essentially asked to play all the power forward minutes in this sort of setup, with small contributions from bigger wings like Robert Covington and Justin Anderson. This would be allowing perfection to be the enemy of goodness, however — Simmons' versatility allows the Sixers to play funky lineups and spell different players as needed, ultimately providing the team juice for crunch time. Schematically, this junks things up for how Miami wants to defend the Sixers. The Heat have left a lot of help around the free-throw line to combat the Sixers' reliance on dribble handoffs, but that's not a viable strategy if the player you're helping off of is Ilyasova instead of Amir Johnson. The calculus changes a lot if the perimeter outlet is Ilyasova rather than Amir Johnson, and even if he's not taking the three he's setting off breakdowns when late closeouts come. Philadelphia has been almost six points better than Miami per 100 possessions when Ilyasova has been on the floor in this series, and so long as they're not making the Sixers pay on the defensive end when he's on the floor, Ilyasova should be getting a healthy chunk of those backup five minutes. Chasing shooters around screens is not even a little bit fun, particularly when you know you're trailing someone who is prolific from deep. You're keenly aware of how tight you need to hug your man to prevent made baskets, which ends up leading to being rubbed out of plays by hard and intelligent screens. We can be frank here: there are not many guys with the moxie and the awareness to keep chasing around screens deep into games, especially when a team has two guys who make their living there like Redick and Marco Belinelli. Miami's defense can only hold up so long when you're asking a player like Wayne Ellington to keep up with Redick. The Sixers' sharpshooter has freed himself up in any way you can think of, whether he's using the screen of a teammate or just using the threat of a curl against the opponent to free himself up without a pick. Philadelphia has generated a ton of open shots for Redick and the other shooters on the squad but his attempts haven't been falling. That's perfectly fine, and it shouldn't stop them from continuing to hunt for Redick threes throughout the game. Eventually, the shots will fall, and his numbers will begin to normalize toward what you know and (usually) love about Redick's game. The one thing Philadelphia absolutely can't do is let the game devolve into bully ball, which the Heat have tried to prompt all series. It's the smartest possible play on their end — they can't keep up with the Sixers from a talent perspective, and their only reasonable path to advancing is to disrupt the Sixers with physicality. Outside of a moment in Game 3 in which Anderson almost took Dwyane Wade's head off with a response to a game of tug-of-war, the Sixers have done an excellent job of keeping their composure. This ranks among the best surprises of their young playoff run — the Sixers have responded to Miami's physical tactics with composure, not allowing it to lead them away from the path that brought them here. It certainly helps that your rookie playmaker is one of the most serenely calm players in the league. Embiid is not wired in that same way, and with his first playoff game in front of the home crowd looming you never know what could happen. There will be a good deal of nervous energy for Embiid, as there would be for any player who waited so long and worked so hard for this moment. Channeling that in a positive manner will be the key, and Miami has all the incentive in the world to try to goad him into getting himself in trouble. Thankfully, it seems as though Embiid has returned with the right attitude in his mind. Teammates and Embiid himself have relayed that he told Coach Brown that he just wanted to fit into what the team was doing upon his return, and though he demands his touches as any great player would, there is no real selfishness within Embiid. He wants to win and do right by the team, which includes not taking the bait if (and when) one of the Heat players tries to cross a line and get him riled up. As long as the men in that locker room focus on the task at hand and the things they can control, the Sixers will be punching their ticket to round two by the end of Tuesday evening.